The Sting is as close to a perfect movie you're gonna get, ranking up there with The Godfather, Apocalypse Now, The Good the Bad and the Ugly and Shawshank Redemption. It was a huge production that won a whole bunch of Oscars, and was a tremendous success when it first came out. Yet, for some reason, it is very rarely mentioned, and just about non-existent when compared to the aforementioned films. 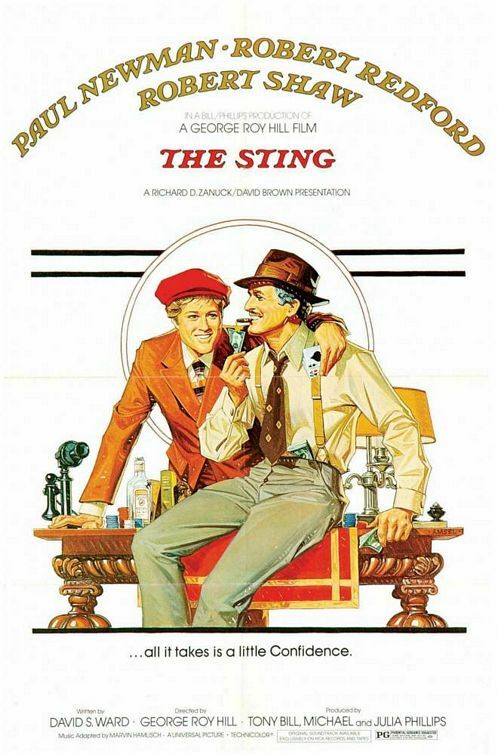 Like watching a good flower power film about the hippy times, The Sting paints a picture of the 30s in such a way that you will be wishing you were around in those days. The plot is a ballet of perfectly knitted scenes which entertain to no end, and a whole pile of twists that spin you around like a ballerina. Paul Newman and Robert Redford were born to play the smiling con-men, both with a whole pack of aces up their sleeves, and the music... well... can't you hear it playing in your head already?